The holidays are right around the corner and, as we recently discussed, many companies - especially retail, transportation and warehousing companies - are ramping up efforts to hire seasonal workers. Utilizing temporary employees during the holidays has long been a popular practice of organizations across a wide range of industries. However, given the tight labor market and shortage of skilled talent available, the recruitment landscape is incredibly competitive this year, even though a large portion of companies started their holiday recruitment efforts earlier than usual. According to a holiday hiring report recently released by Snagajob, 90 percent of employers plan to hire this year, with 86 percent saying they expect to transition temporary workers to full-time employee positions once the holidays are behind us. And while this is great news for those looking for temp positions, it is somewhat concerning for the hiring companies. Holiday hiring can be difficult, but it is not impossible. The key is to go about it carefully and strategically. However, you also need to act quickly. The holidays are fast approaching, and the longer you wait to begin your seasonal recruitment, the less chance you have of gaining the top talent you desire. When it comes to holiday hiring, time is of the essence. You don't have as much leeway when it comes to vetting candidates right now as you otherwise would. To optimize the recruitment process, you need to make sure you are asking the right questions. For example, do candidates work well under pressure? Do their schedules allow them to work the kind of hours your company's holiday season demands? 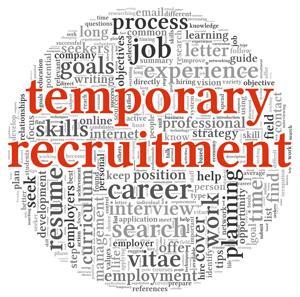 It is important to figure out ahead of time what it is you need in a temporary worker. Creating an ideal candidate profile can help you more quickly and efficiently filter out those who don't meet the preferred requirements. However, given that the market is so competitive right now, it also recommended that you establish ahead of time what you are willing to negotiate on. For example, maybe hires need to have retail experience, but you're willing to compromise on the type of inventory management system they are skilled in using. Decide which aspects of the role you can sacrifice for the sake of your immediate needs. There are certain situations where it is highly recommended you outsource seasonal hiring. For example, if you don't have the in-house talent, time or means to do it in the tight budget or timeframe you need to, a staffing agency will prove helpful. Another scenario where it makes a lot of sense to outsource is if temporary hiring and seasonal workers are not an area of business you are familiar with. Since there are certain compliance and regulatory requirements with temporary worker contracts, inexperienced employers will often be better served to outsource these functions to avoid landing in hot water with the law. To make the most of your existing workforce and maximize productivity during what is likely the busiest time of the year for your company, take advantage of the opportunity to outsource certain services. Streamlining certain tasks and functions to third-party providers during the holidays can help take some of the lower-priority tasks off the plate of core, top performers and free them up to focus on more critical aspects of the supply chain. Whether it is to a temporary staffing agency or third-party logistics company, outsourcing can be an incredibly valuable and cost-effective solution to utilize during the chaotic holiday season.